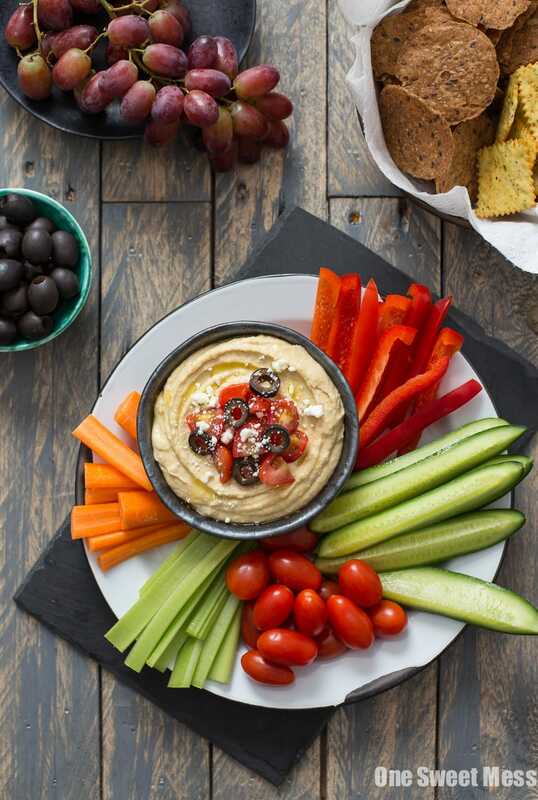 Sweet cherry tomatoes, crumbled feta cheese, and salty olives get spooned over creamy hummus and paired with all the fixin’s. I love to eat, but I don’t always have time for an official meal. What you see pictured above is a farce. Yes, I love hummus. Yes, I eat it on the daily. But what I don’t do is style it to look like it appears above. Instead, I prep all of the elements you see so perfectly styled above and store them in my fridge for safe keeping until I’m ready to chow. Real life isn’t a page torn out of a magazine. Real life is messy. Real life is thrown together. Real life is grab-and-go. I only make things look pretty when I have guests coming over; otherwise, I pull all of the veggie containers and tub of Sabra Hummus out of the fridge and line everything up on the counter for easy access. Real life is also eating at the counter. I’m a grazer. I like to come and go, snagging a carrot here and there before heading back to my studio to continue working. Sabra Hummus is a great unofficial meal option. Serve it for lunch. Turn it into a healthy snack. Or, do what I do and hand the platter over to your family to help tide them over until dinner. With all the hummus in their mouth, it’s hard to whine about being hungry. In a small bowl, combine tomatoes, feta cheese, and kalamata olives. Spoon over hummus. Serve with an assortment of veggies, tortilla chips, and pita bread. Disclosure: This recipe was developed for the lovely folks at Sabra. All opinions are 100% my own. For real – why isn’t this hummus party in real life?!?! This looks so good girl! This is perfect! Olives and hummus are so good, and I honestly have hummus platters for dinner sometimes. I’ve always thought they should have a Greek option, love that you made one! We frequently have what we call “Platter Dinner” where we just pile veggies, dips, crackers, cheese, nuts, etc. on a big board and eat. It’s exactly what you said – an “unofficial meal” but it’s always a hit. 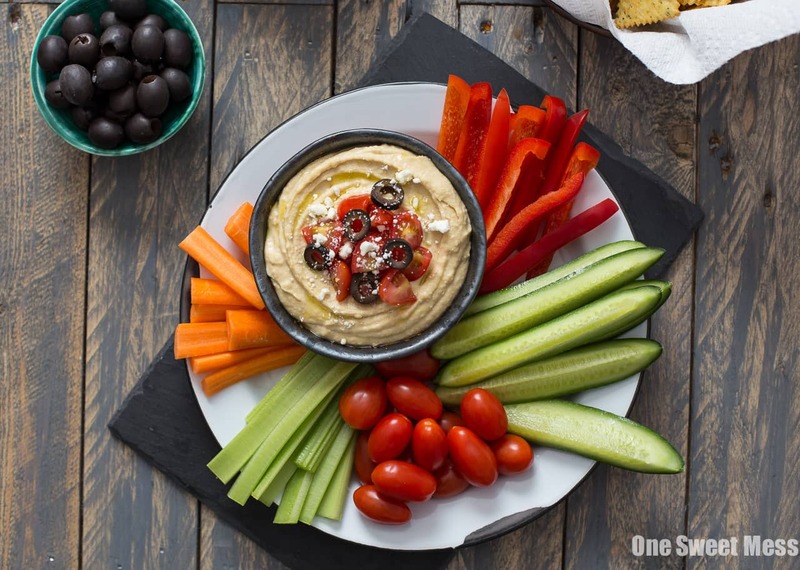 Can’t wait to try your Greek hummus idea – looks fabulous!